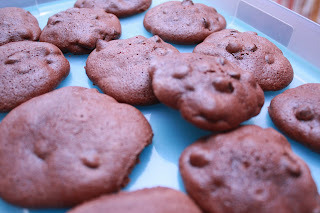 This post will be short and sweet (like this amazing cookie) since I only remembered to take a photo once I was literally done baking them and storing them in Tupperware. The recipe worked out well for me, although I will tell you that instead of baking the cookies immediately after the batter was done, I instead put the batter into the fridge overnight. Mostly I did this because I didn't have the time to bake them, but also because the batter seemed runny to me and I wanted to ensure they would bake well. Also, be very careful not to over-bake them. The recipe called for 10 minutes of baking time, but I only did about 8. They are really quite good -- not too sweet either. It really is like eating a piece of brownie. The only thing I was considering this morning though....is whether or not I should make a little chocolate icing topper for them.